deep fried tofu garnished with bean sprouts, cucumber and scallion. Topped with a thick sauce is prepared with shallots, garlic, chili peppers, shrimp paste, soy sauce and tamarind juice. Tahu goreng (Indonesian spelling) or Tauhu goreng (Malaysian and Singaporean spelling) is a dish of fried tofu commonly found in Indonesia, Malaysia and Singapore. When preparing the dish, cakes of hard tofu are deep fried until golden brown. The bean curds are then cut diagonally in half and arranged on a plate garnished with bean sprouts, cucumber and scallion. A thick sauce is prepared with shallots, garlic, chili peppers, shrimp paste, soy sauce and tamarind juice. In Indonesian and Malay language; tahu or tauhu refers to 'tofu' and goreng indicates 'fried'. Tofu was originated from China and brought to Southeast Asia by Chinese immigrants to the region. Fried tofu cannot be claimed as a dish exclusively found in Malay cuisine or Indonesian cuisine since tofu and fried tofu are consumed extensively in Asian cultures, and has found its way into mainstream Western vegetarian diets. Tahu goreng is largely similar to the Japanese dish agedashi tofu where the latter is not spicy and uses fewer condiments, although both versions use generous servings of soy sauce. Plain 'tahu goreng' on white rice, without side dishes and embellishments. Tahu isi: (lit: filled tofu), probably the most popular variant of tahu goreng in Indonesia, tofu filled with bean sprouts, carrots and sometimes minced meat is battered and deep fried. It is commonly found in gorengan (Indonesian fritters) vendors. 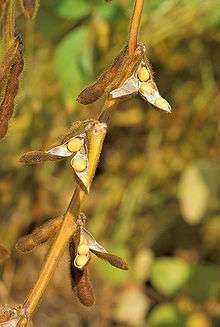 Commonly eaten with cabai rawit (bird's eye chili). Tahu sumedang: the name derived from Sumedang city, West Java. Pioneered by Tahu Bunkeng tofu store in Sumedang established by Chinese immigrants in 1917. Tahu gejrot: fried tofu in hot sweet and sour thin sauce with shallots and chilies, originated from Cirebon city, West Java. Tahu taoge: stir fried diced tofu with beansprouts. Tahu campur: (lit: mixed tofu), with beef slices, vegetables, beansprouts, and noodles or rice vermicelli, served in thin broth. The dish is common in East Javan cities, such as Malang, Surabaya, and Lamongan. Tahu gunting: (lit: tofu cut with scissor), fried tofu in thick sweet and spicy peanut sauce, originated from Surabaya city, East Java. Tahu telur: (lit: tofu with egg), with omelette, beansprout, peanuts, and lontong rice cake, served in thin sweet and sour soy sauce. Also originated from Surabaya city, East Java. Tahu bulat (round tofu) or tahu bola also called bola-bola tahu (tofu balls): is a relatively new variant of fried tofu from Tasikmalaya. The tofu is mixed with seasoning and printed in balls or rounded form, and later deep-fried in cooking oil. Kupat tahu: (lit: ketupat with tofu), ketupat rice cake, beansprout, served in thick sweet and spicy peanut sauce, common throughout Java, however the most popular variant came from Kuningan, Magelang, Solo and Surabaya. ↑ Indah Morgan. 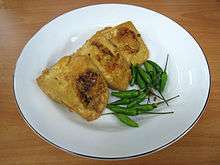 "Indonesian stuffed tofu (tahu isi)". SBS Australia. Retrieved 26 August 2014.